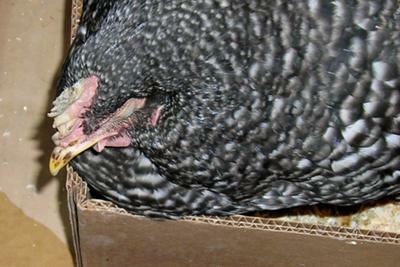 Aretha, A Barred Rock hen with lots of issues is approx. 8 mo. old. Earlier in fall she was the largest bird in the flock. A few months ago, she started staying away from others, moving slower, acting cold, poor appetite. At first thought she was just not adjusting to the winter cold in spite of being a Barred Rock. Finally after researching, thought she had sour crop about 6 weeks ago, made her vomit 4 times (Was very terrible-smelling and lots of stuff in the vomit even though she had not been eating) and she seemed to be recovering--eating and hanging with the others. In early January temps dropped here in MN and she finally became hypothermic during the worst of it a couple of weeks ago--I believe. Also her comb is shriveled and pale, even more so than a photo taken of her in late December. I thought it was from the cold, but perhaps it is nutritional? Had to dip her head in sugar water for a few hours and keep her warm before she started to improve. Gave her warm baths and dried her with the hair dryer--which she loved!! Kept her in our house for a couple weeks while temps plummeted outside. She seemed to be improving--appetite was good, and she was talkative. Started to move her out with the others during the day and back inside at night to be warm. She is just soooo bony now--no fat on her bones at all. In fact, I almost hate to pick her up--afraid I will break her bones in doing so--sounds like they are rubbing together! Poops sometimes seem normal, other times are runny and white, sometimes green. Have not seen anything unusual in the stools-no worms or blood. She doesn't appear to wheeze and until this morning, for the most part seemed happy. She answers whenever we talk to her, except when she is very ill. Last night she was very talkative, not only to us, but to the cats as well. After she had a breakfast of scratch grains, egg mash and some oyster shell, moved her out to the coop with the others a few hours ago. A few minutes ago, did an "egg sweep", and she was hidden behind something, trying to stay warm. I again brought her inside to warm up, and she is sitting with her eyes closed. For a few weeks now, have been feeding her extras like noodles and rice and occasionally sardines to try and get some weight back onto her body. What do you think is wrong with my girl Aretha? When she was first ill, I tried to find a vet that knew something about chickens, but apparently the thinking in So. MN is that if something is wrong with one of your hens, permanent removal is the answer, because it is just a chicken! My girls are all pets and receive a lot of attention and care. I am not a person that is able to "cull", so if it is something serious, someone else will need to do it for me. Sounds like you have been doing a lot of good things for her and helped her have a strong will to survive. Finding a good chicken vet can be difficult, for the reasons you mentioned above. The shriveling comb can be related to freezing and sub freezing temps. Often frost-bite will attack the tips of combs and wattles. Staying warm in winter requires extra calories and in some cases supplemental heat. You didn’t mention trying antibiotics and her diet could be lacking fruits and vegetables, which might help. If this all started with a sour crop, it’s possible that her body was exposed to a high level of bad bacteria for a considerable time. This can affect all the major organs. Added nutritional support could be: live culture yogurt or a pro-biotic supplement (both provide good bacteria for digestion and can help fight bad bacteria bringing balance back to her digestive system). Electrolytes and vitamins and minerals might help restore and balance all internal functions. If she is eating well, but not gaining weight the pro-biotics or live cultures can help break down foods so she can absorb more nutrients. Fresh fruits provide sugars and enzymes that also help to break down food for better absorption while giving a boost of energy and vitamins. If this were my girl I would dose her with a chicken multivitamin for three days, especially one with D3. I would keep her on a chick start or grower feed, free choice, and offer her good grain based treats like whole grain pastas, oatmeal, breads & raw whole grains. You might consider a product like “Nutrical”, a calorie, fat, vitamin, mineral supplement for cats and dogs. You might also get a few cans of a high quality kitten growth food and feed it fresh several times a day. Science Diet comes to mind, but there are others. She sounds like a survivor to have gone through so much already. We wish both of you good success in her getting healthy.